Have a question about Car2Go? Read about a recent interview with the CEO Nick Cole to learn about how Car2Go works with city transit systems and how home area boundaries are determined. A Midnight March for Metro will take place this Saturday, April 6. Transit riders and supporters will march up Magnolia Bridge to demonstrate the impact of cuts to transit service. Carpooling may be available for non-Magnolia residents who wish to join the march. Metro is still facing a funding shortfall of $75 million. Though Metro provided 115 million rides in 2012, they are facing a cut of 17 percent of services in 2014. Read about potential effects, and learn how you can participate in helping the future of Metro. Jackson Park now has a new path, a 2.2 mile gravel trail that encircles the old golf course. The trail has several entry points, with the most accessible ones being from the main golf course parking lot and from the Park & Ride lot at South Jackson Park. The Seattle Department of Planning and Development, the Seattle Planning Commission, and the Downtown Seattle Association will present a day-long conference entitled“Ingredients for Designing a Family-Friendly Downtown.” The conference will take place April 11 at City Hall from 8 a.m. to 5 p.m. The Surgeon General Regina Benjamin announced a walking campaign this week as a part of National Public Health Week. A recent medical study of injured pedestrians and cyclists in New York City found thatpedestrians are most often struck by cars while in the crosswalk, with the signal on their side. 44 percent of pedestrians were using a crosswalk while on a signal, 23 percent were hit while crossing midblock, and 9 percent were crossing against the signal. The majority of collisions occurred between 9 a.m. and 6 p.m.
A new report from the U.S. Department of Health & Human Services, entitled “Physical Activity Guidelines for American Midcourse Report: Strategies to Increase Physical Activity Among Youth,” suggests ways to increase physical activity where youth live, learn and play. Greyhound bus passengers found themselves locked outside a terminal in -17 degree weather waiting for a connection, which led to an internet petition that gained over 90,000 signatures. Greyhound says it will ensure that its terminals’ and agents’ hours now correspond with scheduled arrivals and departures. 68 members of the U.S. House have signed a letter to the Secretary of Transportation asking for the Department of Transportation to follow through on recent legislation that will work to reduce pedestrian and bicyclist fatalities. A project in Phoenix, designed to guide transit-oriented development in five districts, is focused on creating more walkable, mixed-used neighborhoods. 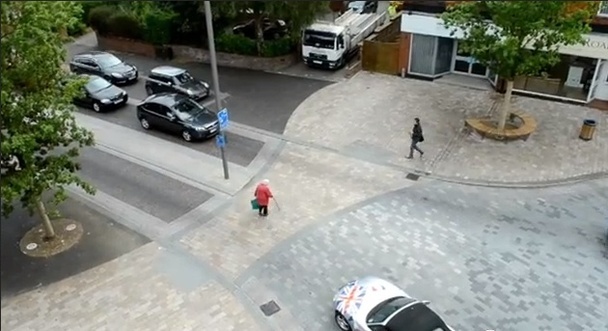 The village of Poynton in the U.K. created a shared space for cars and pedestrians in the middle of their town, with no traffic lights, traffic signs or crosswalks. Although 26,000 vehicles pass through the village center each day, the number of accidents have been reduced from 17 to four, and 88 percent of businesses have seen an increase in foot traffic. Recent data found that London buses have hit 3,591 pedestrians and 1,219 cyclists since 2007, which equals about two pedestrians or cyclists per day. Google’s Street View may change the way people approach travel and even behave. Travelers can view restaurants and coffee attractions around potential hotels, and house hunters can scour homes in a neighborhood, for example. A recent study found that Londoners who are between 12-18 years of age see riding the bus as an extension of their social networks. Free bus travel also increased their ability to travel independently. Photo courtesy of “Regenerating Poynton” via The Atlantic Cities.